Available in tablet form for dogs and cats. 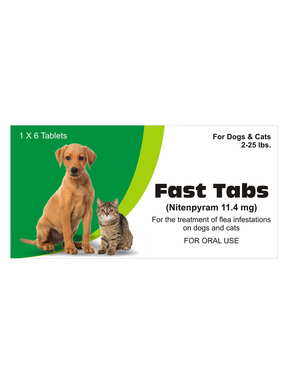 Fast Tabs (Nitenpyram) is an oral tablet for dogs, puppies, cats and kittens 4 weeks of age and older and 2 pounds of body weight or greater. Active Ingredients: Fast Tabs Tablets contain 11.4 or 57.0 mg of nitenpyram, which belongs to the chemical class of neonicotinoids. Nitenpyram kills adult fleas. Directions: Fast Tabs kill adult fleas and are indicated for the treatment of flea infestations on dogs, puppies, cats and kittens 4 weeks of age and older and 2 pounds of body weight or greater. A single dose of Fast Tabs should kill the adult fleas on your pet. If your pet gets re-infested with fleas, you can safely give another dose as often as once per day. To give Fast Tabs, place the pill directly in your pet's mouth or hide it in food. If you hide the pill in food, watch closely to make sure your pet swallows the pill. If you are not sure that your pet swallowed the pill, it is safe to give a second pill. Dosage: Fast Tabs Tablets should be administered according to the following schedule. Weigh your pet prior to asministration to ensure proper dosage. Do not administer to pets under 2 pounds. Adverse Reactions: Laboratory and clinical studies showed that Fast Tabs are safe for use in dogs and cats, puppies and kittens 4 weeks of age and older and 2 pounds of body weight or greater. Other Information: Fast Tabs Tablets begin working within 30 minutes. In studies, Fast Tabs achieved greater than 90% effectiveness against adult fleas on dogs within 4 hours and cats within 6 hours. Fast Tabs are safe for pregnant or nursing dogs and cats. When using this product, you may notice that your dog or cat will start scratching itself as fleas begin to die. The scratching behavior is temporary and is a reaction to the fleas, not the drug. In very rare cases in cats, this may present as transient signs of hyperactivity, panting, vocalization and excessive grooming. Fast Tabs Tablets kill adult fleas that cause flea allergy dermatitis (FAD). Fast Tabs Tablets may be used together with other products, including heartworm preventatives, corticosteroids, antibiotics, vaccines, de-worming medications, shampoos and other flea products. Storage Conditions: Store at controlled room temperature between 59? and 77?F (15-25?C). Works Great - Great Price! This same product in the U.S costs 4x as much and does the same thing. This product from Joe's works great and I always see immediate results in both our cats and dogs.